ABIN185152 (10µg/ml) staining of paraffin embedded Human Pancreas. Microwaved antigen retrieval with Tris/EDTA buffer pH9, HRP-staining. 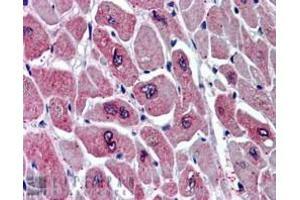 ABIN185152 (5µg/ml) staining of paraffin embedded Human Heart. Steamed antigen retrieval with citrate buffer pH 6, AP-staining. Specificité This antibody is expected to recognise both reported isoforms (NP_058644.1, NP_001032358.1). Immunogène Peptide with sequence C-GSRIRGDGSGFSL, from the C Terminus of the protein sequence according to NP_058644.1, NP_001032358.1. DS WB Results: Approx 40 kDa band observed in lysates of cell lines Jurkat and glioblastoma U251 (calculated MW of 37.4 kDa according to NP_058644.1) . Recommended concentration: 1-3 μg/mL. Primary incubation 1 hour at room temperature. DS IHC Results: In paraffin embedded Human Pancreas, shows strong cytoplasmic staining in rare cells of intralobular ducts. Recommended concentration: 10 μg/mL. 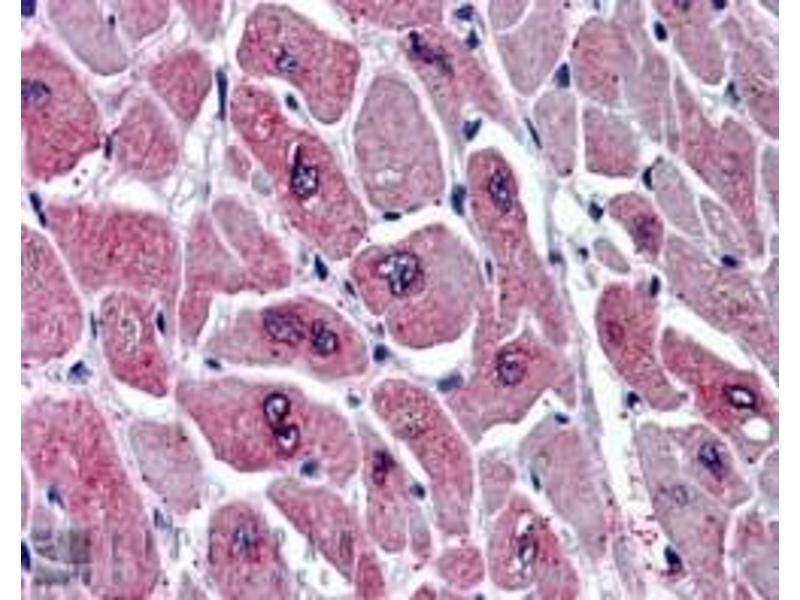 Also tested in paraffin embedded Human Heart where it shows speckled staining on myocardial fibres in transverse section. Recommended concentration: 5-10 μg/mL.